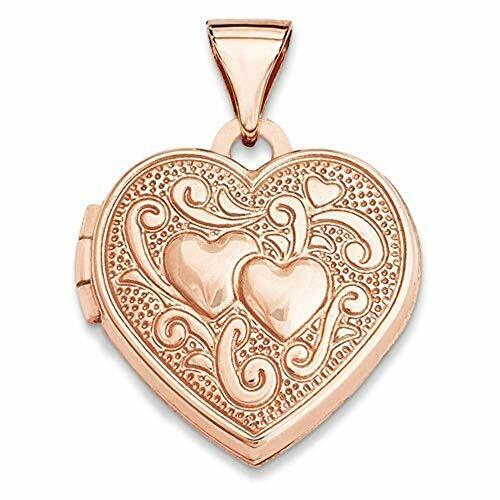 A gold heart locket is a special form of jewelry - one to be treasured, both for its inherent beauty, and for its deep meaning of love or rememberance. 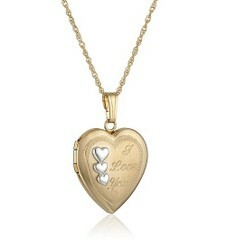 Declare your love on Valentine's Day, an anniversary, birthday, Christmas, or any day, with a gold heart locket. Gold heart lockets are an obvious choice for a sweetheart gift, but they are appropriate for other ladies, and on other occasions, too. 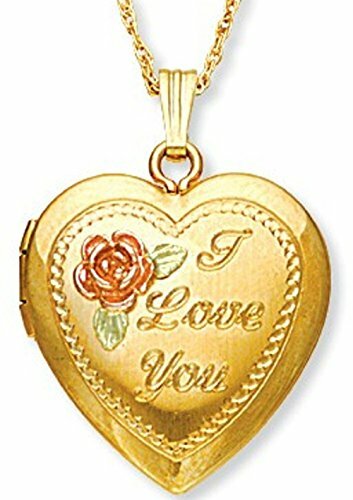 Gold heart lockets are appropriate special occasion gifts for young daughters, sisters, mothers, grandmothers, aunts, or close female friends in addition to a fiance. They speak of many kinds of love, and may be used to say "I am in love with you," but can also simply say, "You are loved." Most lockets are made to hold a memento inside, usually a small photo or two, but some are specially designed to hold a lock of hair. The latter have long been used as a special remembrance. A heart shaped locket is extra special because it also conveys the message, "You will always have a special place in my heart." Throughout the ages, gold, especially yellow gold, has been thought to represent the warmth and power of the sun. So, it is only natural that gold was, and still is, worn as a symbol of status, wealth and power. More than that, however, gold represents the warmth and power of the sun. It is thought by some to bring spiritual awakening to a receptive wearer. Others believe wearing gold invokes healing effects for certain aliments, including arthritis, and some blood, skin and heart related disorders. However, I think a lot of us just appreciate its lasting beauty. After all, as everyone knows, gold doesn't rust or tarnish. So, for many ladies, to receive a gift of gold is also like receiving a tangible symbol of a love that promises to last, whether it's the love of a sweetheart, a spouse, a parent or a child. The absolutely beautiful 14 karat gold heart locket shown just above, made of authentic Black Hills Gold, seems made to order for a very special gift for an extraordinary lady. 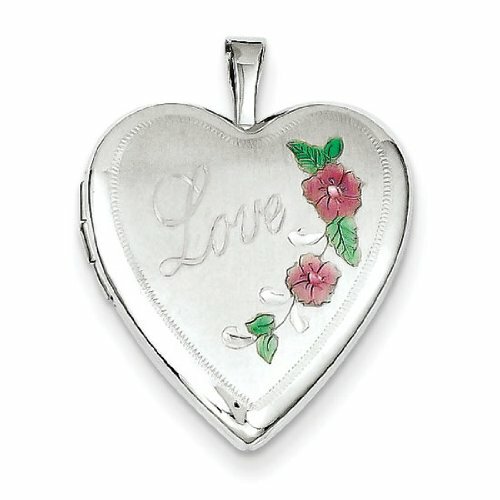 The pendant hinges open to reveal frames for two special pictures of her sweetheart or family members. It would be a sure-to-please gift on an Anniversary, Birthday, or on that very special day when you are ready to declare your love! Whether she's your mother, or the mother of your children, she'll know you care when you delight her with this beautiful wearable keepsake that's a reminder of your faithfulness. What Do Karat Markings on Gold Jewelry Mean? Look on gold jewelry for a marking consisting of a two digit number, followed by the letter k. Divide the number by 24 to determine the gold content. By law in the United States, jewelry of less than 10k cannot be sold as gold jewelry. Whenever you want to say "I Love You." If pure gold is yellow or golden colored, then how are those lovely white and rose golds produced ? By alloying (or combining) gold with other metals, the color of the gold is changed to produce white gold and rose gold, and even other colored golds. There are actually other alloys that product different colors of gold, but those colors are not as commonly used in jewelry making as are rose and white gold. Some of them are red, green, gray, blue, and purple. Little Girls Like Gold Hearts, Too! Daughters are especially precious. A gift of special jewelry is a memorable way to celebrate a particular date or time in her life - a special achievement, birthday or milestone. There are special lockets made especially for little girls. My adult daughter still treasures the one she received the day of her sixth grade graduation. It was similar to the one shown here. Yes, I love the mixed golds, too. Haven't seen that movie. Is it a favorite of yours? CruiseReady, Jewelry that combines all the different golds end up as my favorites even though the rose locket is super-attractive here. I never can look or read about lockets without thinking of the movie Cast Away with Tom Hanks and Helen Hunt! And right now gold is lower in price than it was just a few years back. They certainly are! I have a gold locket that belonged to my mother... it's not a heart, but it's absolutely beautiful. I still have the one I received when I was about 5 years old. Heart lockets are a wonderful keepsake. Say I Love You to a special lady any day of the year with a red heart necklace. For Christmas, Valentines, birthday, anniversary, or whenever, Rubies or Garnets, will thrill her!